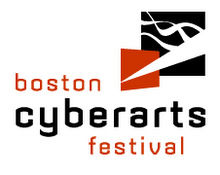 Stay tuned for the 2011 Boston Cyberarts Festival at museums, galleries, theatres, universities, and public spaces in and around the Boston area. The Festival is the first and largest collaboration of artists working in new technologies in all media in North America, encompassing visual arts, dance, music, electronic literature, web art, and public art. This is our blog. Thanks to Zebbler for organizing this event. Dead/Live Video...5/2/09 from Boston Cyberarts on Vimeo.